Transplanting lilac bushes is best performed in the early spring before any leaf growth or late fall just after leaf drop. When digging up a lilac bush, a large root ball must accompany the bush for best results and survival. Before removing the bush, you should prepare a new hole ahead of time, as the roots will not tolerate much time being exposed to the outside elements. This might cause the roots to dry out and damage the upper branches. The condition might lessen the chance of survival for the transplanted bush. Use the shovel and dig the new hole in which the lilac bush will be planted. 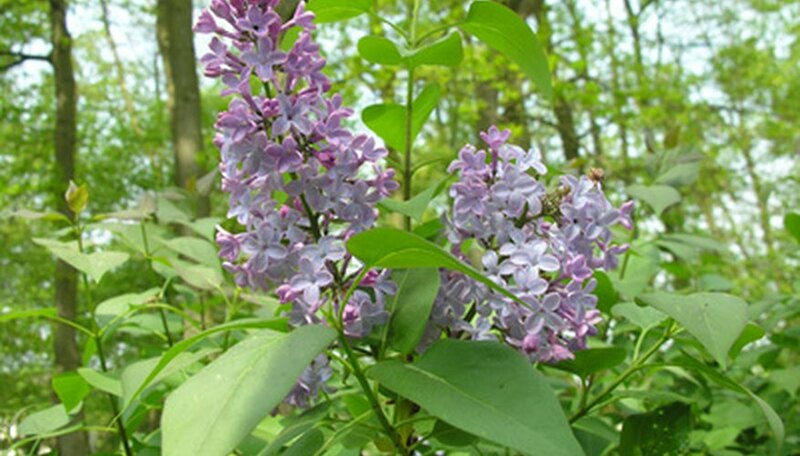 Most lilac bushes will require a root ball of at least 36 inches in diameter with a depth of 18 inches to 24 inches. It is better to dig a larger hole than is needed. Mound the soil to the far side of the new hole. This will allow for easy access when setting the lilac bush into the ground. Dig a ring trench around the lilac bush about 36 inches in diameter. Make the trench to a depth of 18 inches to 24 inches. Force the sharp end of the shovel under the roots of the bush. Sever any remaining roots with clean cuts from the shovel. Pry the root ball away from the soil. You might need some assistance to lift the root ball out of the ground. Lay the tarp next to the excavated hole of the lilac bush. Lift the root ball and bush from the hole. Place it on the tarp. Drag the tarp to the new hole for the lilac bush. Set the root ball of the bush into the hole. Place the bush so the best side of the plant shows outward to the yard. Backfill soil around the root ball of the plant. Use your hands to tamp the soil around the roots every 6 inches of soil addition. Continue with this process until the soil is even with the surrounding ground. Water the soil at the base of the lilac bush with plenty of water from the garden hose. This will remove any air that might have been trapped around the roots. Consult your local agricultural extension service for any particular transplanting methods for your climate and area. Some shrubs and bushes can tolerate mid-winter planting depending on the temperature and annual rainfall. Some regulating agencies might require you to identify any underground utilities before digging in your yard. Consult local regulations so you do not hit an underground power wire or water line.